Computed tomography features of bronchial and non-bronchial collateral arterial circulationdevelopment in a dog diagnosed with multiple chronic pulmonary thrombi. Le Roux A., Granger L.A. Reynolds C., Gaschen L. Computed tomography features of bronchial and non-bronchial collateral arterial circulationdevelopment in a dog diagnosed with multiple chronic pulmonary thrombi // J Vet Cardiol. 2013 Dec;15(4):283-7. 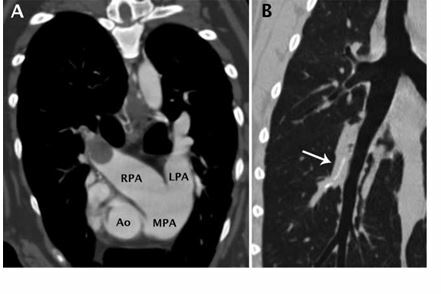 A 5 year-old female Lhasa Apso was diagnosed with a large right pulmonary artery thrombus, multiple smaller pulmonary thrombi, and pulmonary hypertension. In addition, thoracic computed tomography angiography revealed numerous periesophageal arterial vessels, tortuous and dilated bronchial arteries, and an enlarged tortuous left phrenic artery, consistent with systemic bronchial and non-bronchialcollateral arterial circulation development. 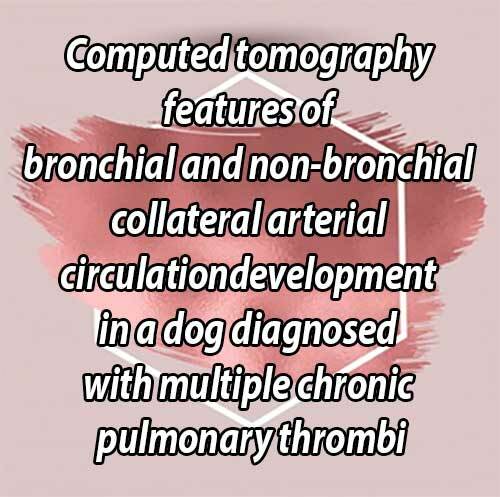 These features of chronic pulmonary arterial thrombi have not been described in dogs but are recognized in people. One year after the diagnosis, the dog was still alive and there were no clinical signs reported. A 5 year-old female spayed Lhasa Apso was referred for a 1-week history of cough, lethargy and decreased appetite. A left apical grade I/VI systolic murmur was auscultated. Lung ausculta¬tion was clear. The dog had a positive heartworm antigen test once 3-years prior, was never treated, moderate pulmonary hypertension.1 A hyperechoic intraluminal nodule, 1 cm in diameter, obstructed the right pulmonary artery, with severe pulmonary trunk dilation visible (Fig. 1). A thrombus or a vascular neoplasm was considered likely. On the CT images, a large non-enhancing soft- tissue filling defect, 30-40 HU, was observed in the right pulmonary artery, with severe pulmonary trunk and left pulmonary artery dilation (Fig. 2A). This lesion extended caudally to at least the third divisional branches of the right pulmonary artery, with an eccentric plaque-like appearance along the arterial wall and faint linear intralesional mineralization (Fig. 2B). Smaller intraluminal fill¬ing defects were observed in several arterial branches of the left caudal lung lobe. These findings were consistent with a chronic right pulmo¬nary artery thrombus associated with smaller caudal pulmonary thrombi. A tortuous vessel was branching from the right of the thoracic aorta, at the 7th intercostal space, coursing toward the heart base along the ventral aorta (Fig. 3A and B), consistent with a dilated bronchoesophageal artery. Multiple tortuous ves¬sels surrounded the thoracic esophagus, branching caudally from the esophageal branch of the left gastric artery, and anastomosing cranially with the dilated cranial thoracic esophagus blood supply (Fig. 3C). Tortuous thin vessels were observed along the caudal bronchi, representing bronchial arteries (Fig. 4A and B). A tortuous arterial vessel, consistent with an enlarged left phrenic artery, was branching from the left ventral aspect of the abdominal aorta, caudal to the celiac artery. It had a tortuous cranial path, crossing the diaphragm on the left, extending within the caudoventral mediastinal reflection, along the visceral pleura of the caudal lung lobes (Fig. 5A and B). Peripheral linear soft tissue attenuations were observed in the lungs (Fig. 4C), associated with subpleural wedge shaped pulmonary consolidations, con¬sistent with chronic infarctions. 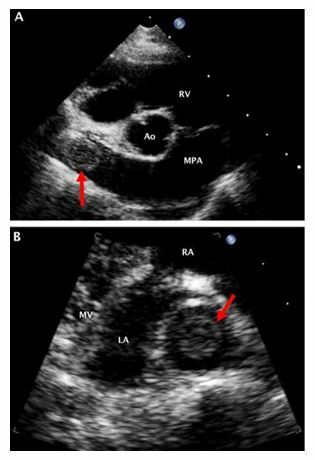 Figure 1 Two-dimensional right parasternal short (A) and long (B) axis echocardiographic images. The main pulmonary artery (MPA) is dilated. The arrows indicate an intraluminal mass obstructing the right pul¬monary artery (RPA). Ao = aorta, RV = right ventricle, RA = right atrium, LA = left atrium, MV = mitral valve. The diagnosis was chronic arterial pulmonary thrombi with pulmonary hypertension and secon¬dary systemic bronchial and non-bronchial collat¬eral arterial circulation. The dog was treated with clopidogrela (2 mg/kg PO q 12 h) and restricted exercise was advised. On 1-year follow-up, the echocardiogram remained unchanged and no clin¬ical signs were reported. a PLAVIX 75 mg, Bristol-Myers Squibb/Sanofi Pharmaceuticals, Bridgewater, NJ, USA. Figure 2	(A) Transverse computed tomographic (CT) images post-contrast in a mediastinal window and (B) precontrast dorsal multiplanar reconstruction (MPR) in a lung window. A large thrombus is observed within the right pulmonary artery (RPA) (Fig. 2A). The main pulmonary artery (MPA) and both right and left (LPA) pulmonary arteries are enlarged (Fig. 2A). Linear mineralization (white arrow, Fig. 2B) is visible within the arterial thrombus extending caudally within the right caudal lung lobe arterial branches. Ao = aorta. Non-bronchial systemic arteries (NBSAs) also develop with chronic thromboembolic pulmonary hypertension and differ from bronchial arteries by their courses. NBSAs enter the lungs through adherent pleura or via the pulmonary ligament, are not parallel to the bronchi, and provide systemic arterial blood to the lungs via transpleural systemic to pulmonary artery anastomoses.11 In people, they usually originate from the brachio¬cephalic trunk, subclavian arteries, thyrocervical and costocervical trunks, axillary arteries, internal mammary arteries, inferior phrenic arteries, celiac artery and gastric arteries.5 In our case, the esophageal branch of the left gastric artery was observed coursing through the esophageal hiatus (Fig. 2B), supplying the caudal one-third of the thoracic esophagus and anastomosing with the periesophageal ramifications of the dilated bron¬chial circulation. Physiologically, the bronchial arteries only have a nutritional role, without gas exchange function. Studies have shown that unilateral occlusion of the pulmonary artery stimulates angiogenesis, leading to bronchial circulation hypertrophy.10,13,14 The quantity of blood that can be transported by the bronchial arteries is limited, and they also become tortuous following unilateral pulmonary artery ligation due to an associated increase in their length.13,15,16 In an experimental study in sheep,13 unilateral pulmonary artery ligation led to increased bronchial blood flow approximately 4 days after ligation, with bronchial arterial diameter being about 3 times the control value within 1 week and reaching a maximum diameter in approximately 4 weeks. Figure 3	(A) Transverse computed tomographic (CT) image post-contrast in a mediastinal window and (B and C) sagittal thin slab maximum intensity projection (MIP) images post-contrast in a mediastinal window. A tortuous vessel (large white arrow, Fig. 3A) branching from the right of the thoracic descending aorta (Ao) is visible, consistent with an enlarged bronchoesophageal artery. CVC = caudal vena cava. The dilated tortuous bronchoesophageal artery (small white arrow, Fig. 3B) is identified, branching from the right of the thoracic aorta as well as multiple tortuous periesophageal arterial vessels, branching from the esophageal branch of the left gastric artery (small black arrow, Fig. 3C), anastomosing with the dilated vessels of the esophageal branch of the bronchoesophageal artery (large black arrow, Fig. 3C). Finally, the clinical signs in our dog were not considered to be secondary to the right pulmonary arterial thrombus, as it showed fea¬tures of chronicity on CT. However, smaller acute pulmonary thrombi or the moderate pulmonary hypertension could explain the lethargy and weakness. It is notable that dogs can have a good quality of life despite large pulmonary thrombi, as our dog was asymptomatic one year after diagnosis, despite the persistent right pulmonary arterial thrombus and moderate pulmonary hypertension. Figure 4	(A) Dorsal and (B) sagittal thin slab maximum intensity projection (MIP) of the left caudal mainstem bronchus and (C) pre-contrast transverse image of the cranial thorax, in a computed tomographic (CT) lung window. Tortuous vessels around the bronchial lumen, consistent with dilated bronchial arteries (small white arrows, Fig. 4A and B) can be identified. Peripheral linear soft tissue attenuations in both cranial lung lobes, and faint subpleural wedge-shaped areas of consolidation, representing chronic infarcts (large white arrows, Fig. 4C) were also observed. Figure 5	(A) Sagittal thin slab maximum intensity projection (MIP) and (B) dorsal MIP of the cranial abdomen. Marked enlargement of the left phrenic artery is visible (small black arrows), extending trough the diaphragm and within the caudoventral mediastinal reflection, along the visceral pleura of the caudal lungs. Ao = aorta, CVC = caudal vena cava, RK = right kidney. Kellihan HB, Stepien RL. Pulmonary hypertension in dogs: diagnosis and therapy. Vet Clin North Am Small Anim Pract 2010;40:623-641. Castaner E, Gallardo X, Ballesteros E, Andreu M, Pallardo Y, Mata JM, Riera L. CT diagnosis of chronic pulmonary thromboembolism. Radiographics 2009;29:31-53. Thrall DE, Badertscher RR, Lewis RE, McCall JW, Lonsonsky JM. Radiographic changes associated with developing dirofilariasis in experimentally infected dogs. Am J Vet Res 1980;41:81-90. Fishman AP. The clinical significance of the pulmonary collateral circulation. Circulation 1961;24:677-690. Yildiz AE, Ariyurek OM, Akpinar E, Peynircioglu B, Cil BE. Multidetector CT of bronchial and non-bronchial systemic arteries. Diagn Interv Radiol 2011;17:10-17. Bruzzi JF, Remy-Jardin M, Delhaye D, Teisseire A, Khalil C, Remy J. Multi-detector row CT of hemoptysis. Radiographics 2006;26:3-22. Bezuidenhout A. The heart and arteries. In: Evans H, de Lahunta A, editors. Miller's anatomy of the Dog. St-Louis: Elsevier; 2013. p. 428-504. The respiratory system. In: Evans H, de Lahunta A, editors. Miller's anatomy of the Dog. St-Louis: Elsevier; 2013. p. 338-360. McLaughlin RF, Tyler WS, Canada RO. Subgross pulmonary anatomy in various mammals and man. J Am Med Assoc 1961;175:694-697. Smith GT, Hayland JW, Piemme T, Wells Jr RE. 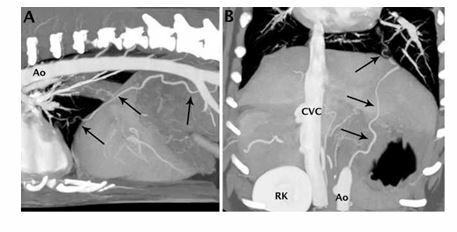 Human systemic-pulmonary arterial collateral circulation after pulmonary thrombo-embolism. J Am Med Assoc 1964;188: 452-458. Do KH, Goo JM, Im JG, Kim KW, Chung JW, Park JH. Systemic arterial supply to the lungs in adults: spiral CT findings. Radiographics 2001;21:387-402. Laitinen A, Laitinen LA, Moss R, Widdicombe JG. Organ¬isation and structure of the tracheal and bronchial blood vessels in the dog. J Anat 1989;165:133-140. Charan NB, Carvalho P. Angiogenesis in bronchial circulatory system after unilateral pulmonary artery obstruction. J Appl Physiol 1997;82:284-291. Williams JrMH, Towbin EJ. Magnitude and time of develop¬ment of the collateral circulation to the lung after occlusion of the left pulmonary artery. Circ Res 1955;3:422-424. LiebowAA, Hales MR, Bloomer WE, Harrison W, LindskogGE. Studies on the lung after ligation of the pulmonary artery II. Anatomical changes. Am J Pathol 1950;26:177-195. Heimburg P. Bronchial collateral circulation in experimental stenosis of the pulmonary artery. Thorax 1964;19:306-310. Bloomer WE, Harrison W, Lindskog GE, Liebow AA. Respi¬ratory function and blood flow in the bronchial artery after ligation of the pulmonary artery. Am J Physiol 1949;157: 317-328. Lilker ES, Nagy EJ. Gas exchange in the pulmonary collat¬eral circulation of dogs. Effects of alveolar hypoxia and systemic hypoxemia. Am Rev Respir Dis 1975;112:615-620. Viola AR, Abbate EH. Respiratory function and effective collateral flow 8 years after ligation of the left pulmonary artery. Am Rev Respir Dis 1973;108:1216-1220.